Please click an image to play the video. From left: Roxanne Hartrich and Angela Rutledge. DogsBite.org - On the fourth day of Canine Victims Awareness Week, we have selected two powerful videos of mothers who have lost a child in a sudden, vicious family dog attack. Roxanne Hartrich of Bloomington, Illinois lost her 4-year old daughter after the family's two pit bulls brutally attacked her in January. Angela Rutledge of Fulton County, Georgia lost her 2-year old son after her family pit bull of 8-years, Kissy Face, suddenly attacked and killed him at their home last year. Each of the videos touches upon the unexpected nature of the attack and the tremendous violence of it. Both fatal attacks involved well-raised and cared for family pit bulls -- raised from puppyhood -- that had previously played with the child countless times. Both mothers have shared their painful stories to prevent this from happening to another family and to offer a warning to other parents about the dangerousness of pit bulls. "Had I known then what I know now," Roxanne reflected. The raw, emotional account of Roxanne will pain the hearts of viewers. 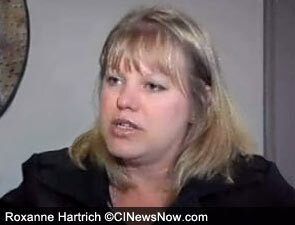 She begins by saying that the day of the horrific attack was her daughter Kara's 4th birthday. The family owned three pit bulls, two males and one female. At the time of the attack, Kara and her younger sister were at the family home being watched by Roxanne's mother. After Kara put a toy away, she came into the room with her grandmother and sister and said, "Brody knocked me into the wall. Brody hurt me." Roxanne said that her mother picked up Kara and said, "I'm sure Brody didn't mean it Kara ... are you okay?" Roxanne said she had barely gotten that out when "Brody came flying from the playroom, and jumped into the air, and attacked my mom and my daughter. He attacked her out of my mom's arms," Roxanne said. Despite her mother's efforts, Brody continued to attack. "He initially went straight for the jugular. He also bit her face, her head, everywhere," she explained. 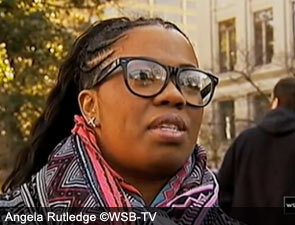 Another raw, emotional account features Angela Rutledge speaking with State Rep. Keisha Waites. In April 2013, Angela's 2-year old son Beau was savagely killed by his family's pit bull at their home. Neighbors who saw the attack scene said it was "like a horror movie." The family had owned the female pit bull, named Kissy Face, for 8-years without any aggression issues. That suddenly changed that day in April, when Angela left her son momentarily to go to the bathroom. She begins by telling Rep. Waites how stealth and fast the vicious attack happened, and how she did not hear any noises. "When I came downstairs, it wasn't because I heard anything," Angela said. "It wasn't because I heard a scream or any banging. I don't even to this moment understand how I did not hear anything. There was no music playing in my house. It was so quick," she said. "I walked down those stairs not expecting anything other than to cook lunch for my son," she said. Many more videos of victims sharing their histories are located on the Victim Videos page.